With a new season upon the horizon, what can Liverpool Football Club achieve this season? With a full pre-season under Jürgen Klopp, getting to know the new and current players, getting rid of some players and assembling his own team, there is a lot of positive energy surrounding the club. Liverpool’s pre-season campaign was all about Jürgen Klopp gaining knowledge from his team and getting to know the new faces. With the squad all coming together, it gave a chance for the players to regain their fitness and for Klopp to assemble his side. Games against Tranmere Rovers, Fleetwood Town, Wigan Athletic and Huddersfield Town were routine wins and did not really test the team, but supporters got to see a few new faces and exciting prospects, Sheyi Ojo, Marko Grujic, Ben Woodburn, and Ovie Ejari producing brilliant performances throughout the pre-season tour. Danny Ings also coming back from a serious injury and getting a few goals showed no signs that it had affected him and is a massive boost for the club. The real test started against Chelsea where Liverpool lost 1-0. Although only a pre-season game, it did wake up the players and staff. Liverpool then moved on to their next game against Italians AC Milan which they won comfortably 2-0, a much improved performance from the Chelsea game. Liverpool then played Italians Roma in which they lost 2-1. A performance which showed great team chemistry but with a complete squad overhaul in the second half changed the dynamic of the team. Liverpool then faced Barcelona and ex Liverpool striker Luis Suarez. In a packed out Wembley, 89,845 attended the friendly the second highest crowd ever at Wembley. The huge attendance saw the Reds hammer Barcelona 4-0. Liverpool finished in second place in the International Champions Cup table with six points, ending behind winners, Paris Saint Germain. 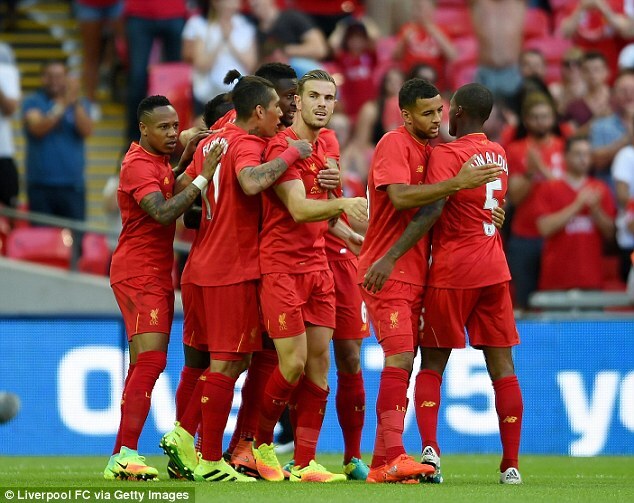 Liverpool’s last friendly was against FSV Mainz 05. Which a lot of Liverpool supporters do not recall. 9 games, 17 goals, 39 players used during pre-season. With the Premier League season now just a few days away, Liverpool and Jürgen Klopp must feel optimistic. As unfortunate as it may be, Liverpool have no European football to focus on, but, this may just play in Liverpool’s favour. Considering Liverpool will only be playing 1 game a week, they have got a whole 6 days to prepare for their next excluding the odd cup game. Liverpool supporters will remember (as painful as it is) the 2013/14 season, Liverpool only had domestic trophies and the league to focus on, in where they nearly won the league, but just fell short. Maybe this year will turn out differently. Another positive is Daniel Sturridge. It looks like his injury days are over (touch wood). Jürgen Klopp looks to have found a happy medium in training and being on the pitch. Sturridge looks fit, healthy and raring to go. Hopefully it will be the season in which Sturridge can fulfill his potential, play in a run of games and hit double figures. His confidence heading in towards the new season is also something Liverpool supporters will be loving. His recent quotes provide tenacity and assurance in where his mind is at. It will also be a big season for the two Brazilian boys, Phillipe Coutinho and Roberto Firmino. With Coutinho being heavily linked to Barcelona and PSG throughout the transfer window, there is no doubt that he can become “world class”, and there is no place better for him to do that then at Liverpool and with Klopp. Liverpool must make sure they are fighting for every trophy and challenging for the league to keep players like Coutinho, otherwise he could as saddening as it sounds, leave for better things. Roberto Firmino who had a good first season in England, will be an exciting prospect under Klopp. With glimpses of magic last season, Liverpool supporters will be expecting Firmino to reach the next level. Both players have an eye for a goal and can find a pass out of no where. Both also have a good connection together on the pitch and will be hoping to produce some quality football and winning some silverware for Liverpool. New signings will also play a major part in Liverpool’s success this season. Loris Karius, Joel Matip, Sadio Mané, Georginio Wijnaldum, Grujic, Ragnar Klavan all look steady and positive signings to push Liverpool on. Karius, Matip, Mané & Wijnaldum in particular are players who will improve the first team and have made Liverpool supporters excited to see. Karius will start and is a position in which Liverpool had needed to strengthen. Matip who was a free transfer, a tall, fast and a threat on set pieces will slot in well at the back. . Sadio Mané who Liverpool supporters should know well, is something Liverpool have needed for a while. A direct, fast & strong attacker who can play in a variety of positions but also score goals. Finally Georginio Wijnaldum, who again Liverpool supporters would have seen play for Newcastle, is a midfielder with skill, power and goals, something Liverpool needed, can also play in a few positions which makes him very versatile. Wijnaldum is also a winner of Dutch Football Player of The Year in which he won in 2014–15 while at PSV. All signings made will be really good assets for Liverpool and will provide something they did not have last season. Players who are on last chance saloon are Alberto Moreno and Simon Mignolet. Both still have a lot to prove to the Liverpool faithful. Both need to show they have the right to start and play for Liverpool. With Loris Karius arriving and being Mignolet’s biggest threat since he joined the club, this is Simon Mignolet’s biggest chance to prove to Klopp and the supporters that he is capable of being Liverpool’s number first choice, considering Karius is out with a broken hand for a few weeks. Alberto Moreno is not a fan favourite at the moment and has a lot to do to regain their trust and reassurance. With James Milner providing competition at left back it is all a very bizarre situation leaving Liverpool supporters wondering why is a left back not being signed with days left of the transfer window. Jordan Henderson has split the fan base. With an injury struck season, a lot of the supporters had changed their opinion on him. It is a very difficult situation for anyone taking the armband off Liverpool legend Steven Gerrard and it was made even tougher with a poor season. Henderson always gives his best on the field and after all Klopp believes in him, although, Henderson has a lot to do to get the support he once had. Football changes very often, for Henderson, was once a sure starter, now, maybe not. Will be intriguing to see how he gets on, if called upon. Last but not least, Liverpool have one of their best signings made in recent years to look forward to, the man himself, Jürgen Klopp. The man who took on a fragile Liverpool team, mid-season and produced some unbelievable nights in Europe and throughout the season, creating surreal atmospheres and making Liverpool relevant again. It really is a chance for Liverpool and Klopp to create a bright future and make new history that everyone associated with Liverpool is craving. At the end of the day, Liverpool Football Club will be judged on what they will achieve in Klopps first full season. Ultimately, Liverpool and Jürgen want to finish in a position knowing they will be playing in the Champions League, back where the club belongs. Liverpool supporters are also craving a trophy after missing out on two last season both just missing that something. A cup run with potentially a trophy and a good league campaign achieving Champions League football or even winning the league should be the aim. Although with other clubs in the league strengthening, it will be very tough, but a goal that can be achieved. It will be another fascinating season with a lot of twists and turns, let’s just hope come May, Liverpool are right in the mix, whether that is for top four or for the league title. They will have a successful season. Much better than 8th place. Klopp has had 10 months to prepare before the season kicks off and he’s purchased a few players now who fit into his mould.